Cho Lam and Leanne share their parenting ups and downs. Revealing their family photo of three on his 39th birthday on January 9, Wong Cho Lam (王祖藍) and Leanne Li (李亞男) are brimming with joy as first-time parents. Afterward, Cho Lam also shared more photos of Gabrielle dressed up in different outfits, presumably by proud mama Leanne. Cho Lam describes how Leanne would express her affection for him before she gave birth. “My wife would kiss my face continuously, especially when I return from travels. She will even wake me up with her kisses! Now she’d kiss our daughter awake,” He also described how “perverted” Leanne and him were, as they would smell their daughter’s “adorable little feet” and are just in love with her newborn smells. Leanne also became a photography addict and would take up to a hundred photos of their daughter every day. “She loved to take selfies in the past, now she has found passion in taking photos of her daughter in different outfits. “It has been three weeks since she was discharged from the hospital, and there were a few days when she had (mood swings) and was feeling emotional. I listened to my father-in-law, he understands (Leanne) very well and instructed me to find out what she needs before she even brings it up, and (to spend) more time with her. If she brings it up on her own it would mean she has quietly been suffering. She was unhappy because I had promised to be home by 9 p.m. once, but due to work I got home at 12 a.m. and she felt alone during that time. I could have done better,” said Cho Lam. Leanne explained that she did not understand why she was unhappy, as she was fine when she woke up the day after delivery. She attributed her emotions to hormones. 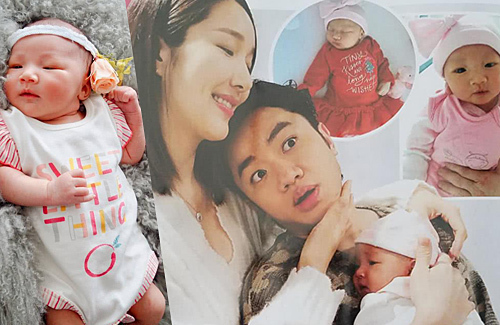 Cho Lam adds that Leanne has been using these three methods to vent her emotions – showering baby with kisses, taking newborn photos of her, and kissing her feet. Though many have the impression that Leanne has strong family values and would likely focus on taking care of her daughter and family after childbirth, she does not intend to leave the entertainment circle. As Leanne and Cho Lam were both well-behaved children, their daughter seems to have inherited their personality and appears quiet and soft-spoken. Asleep for up to 23 hours per day, she wakes for about and hour and both parents would be anxious to see her smile, and that would be their highlight of the day. 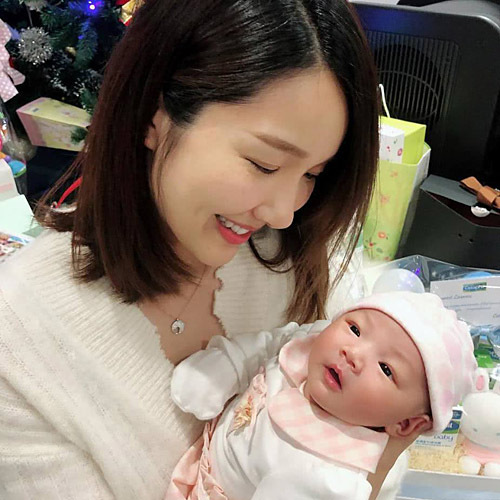 Cho Lam will not be keeping Gabrielle at home and intends to bring her along on visits to friends during the upcoming Lunar New Year festivities, and to hold a 100-day celebration when she reaches her third-month milestone. To thank his wife for her hard work during the past year, Cho Lam has already booked tickets to Japan and plans to bring Leanne on a vacation. Their annual family trip would take place during the summer season; and they would also bring Gabrielle along to visit her maternal grandparents too. it’s perfectly normal to have mood swings after giving birth…hormones were at all time high during pregnancy and after that, it drops way down. this is why women have post natal blues. Uhm, can baby sleep for that long? New born needs a lot of feed 0.o unless they count her closing eyes feeding time as sleeping, that number is totally not right. But I only have 1 baby, maybe I was bad luck lol! Anyway, expectations vs reality + hormones does make a woman mood swing quite often, but most healthy way is to find a mum group, talk to other mums and you’ll find you are not alone, which is a lot more assurance. Be outside the house also help. Sleeping for 23 hours? I hope that is a misprint. Hopefully she has help at home. Newborns are so much work. Not going to grow up as a smart kid if sleeping 23 hours a day…. Yes,, I find these Wong Cho Lam photo poses gross. Because of his short and not handsome appearance, he refuses to stand up straight for a photo and rather act like a baby which actually matches his size…. 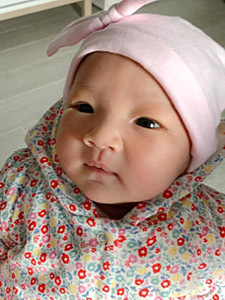 aww their baby is so cute.. has Leanne’s eyes and (yikes) Cho Lam’s mouth and nose. She is adorable tho, a little angel. I know that Cho Lam and Leanne will put a lot of time and care toward their daughter, unlike other artists. This will be a happy family.